Brad Neuberg created some examples of offline projects in order to find a common UI or offline web applications for the Dojo Offline Toolkit. He has put together examples for Gmail, Blogger, and a corporate portal. The first thing to notice is the addition of a new widget on the left-hand side of the page, the Offline Info widget. This widget encapsulates all of our offline functionality for Gmail. 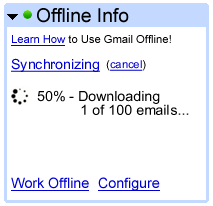 If the Dojo Offline Toolkit is installed and you sign into Gmail, Gmail will automatically download your 100 newest emails into the offline cache. 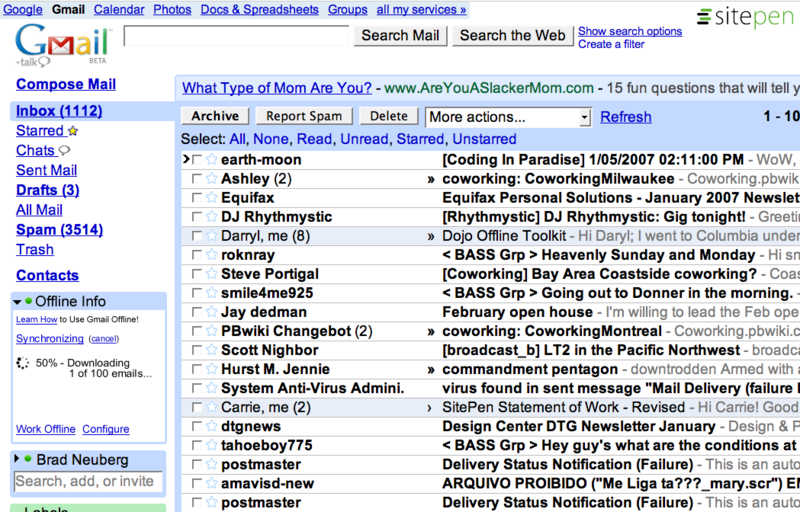 Now you can access Gmail offline to read your newest emails or compose new ones. When you sign back on your emails will be automatically synced and uploaded. On page load, Blogger would automatically download the last 10 blog posts, including images used in those posts. Individual blog posts indicate next to them if they have been locally modified (â€modified offlineâ€). If a blog post is not downloaded offline yet, the link â€œDownload offlineâ€ appears, which when clicked causes the Offline Info widget to show download progress information, just like a sync. If you have local items that have not been synced, and have elected to sync manually, a small â€˜(recommended)â€™ label will appear next to the Synchronize button. The rest of the offline UI is pretty much the same, including the DOT download page, the syncing UI, and the configuration UI. The configuration UI might possibly have a small number of application-specific configuration, such as â€œ Newest Posts Synced,â€ where  is a text field that can take a number. In my mind the achilles heal of most web applications has been the inability to save locally and work offline. If implemented correctly the ability to use web applications offline should put them on track to replace their traditional counter parts sooner than would be expected. The last barrier is to get web applications behind corporate firewalls but Google with it’s search appliance penetration seems particularly well suited to doing this. Essentially, the public is field testing these applications now which gives them a proven track record for performance, compatibility and ease of use. I wouldn’t be a bit surprised to hear them announce the Google “Productivity Appliance” or some such name sometime down the road. Probably sooner than you think. Interestingly, Douglas Bowman from StopDesign is now working for Google. However, prior to working for them he did a series of Blogger Templates. Ok, so how does this fit in. Well, simple. Corporate branding. Give Corporations branded web applications that sit behind a firewall, can be used off line and can meet or exceed the real needs of most current Office users. Soon the internet will cover all areas over the world and you are worried about work offline? Work offline = stupid! Presumably because you want Gmail to be the MUA… If there were a decent mail client that could handle Gmail tags, then yeah, this would be pointless. But the way things are now, I’d love to have an offline Gmail, even if it is only for the last 100 messages (I’d add in starred items as well). It is a fine idea!